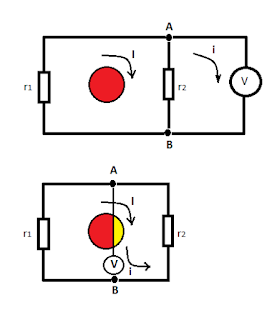 Is Walter Lewin wrong about Kirchhoff's law? Thinking how to organize the upcoming material about geometry and physics I came about a recent controversy about an electromagnetism lecture by Walter Lewin and I want to talk about it in this post. on minute 34:54 the fireworks begins. The setup starts unassuming: a trivial circuit with a 1 V battery and two resistors in series. The current is computed as well as the voltage drop across the larger resistor. Then the battery is removed and is replaced by a solenoid in the middle of the circuit which generates an increasing magnetic field such that the induced voltage is the same 1 V as the battery. Now the question becomes: what is the voltage drop on each resistors? The answer is that two voltmeters connected on the same points one on one side of the loop and one of the other side will record different voltages of opposite polarities! In this case one will record +0.9 V and the other -0.1 V. And the experiment confirms this!!! This is deeply at odds with our intuition and there are a lot of "proofs" of why Lewin is wrong. Here is one example which has the advantage over others that it is in English. Lewin responded to those challenges in two distinct posts in a poor manner in my opinion: he simply repeated slowly and loudly his explanation and did not address the root cause of the discomfort people experience when presented with this counter-intuitive phenomena. So I will attempt to add my own pedagogical explanation of how to understand this. First, are the two voltmeters connected on the same points? It is not clearly visible on the video how the two voltmeters are connected, but if you have access to an electronics lab you can actually connect the two voltmeters on the very same points and repeat the experiment. 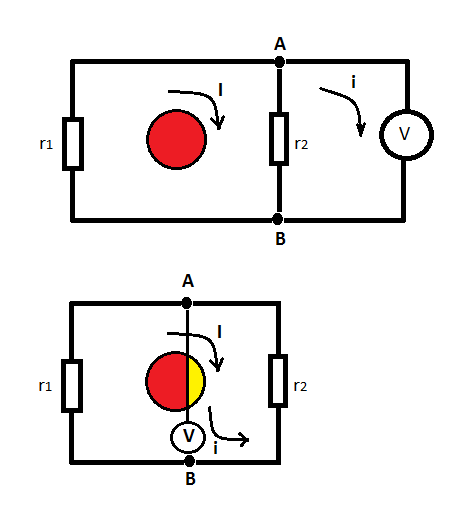 So how is it possible that two identical voltmeters connected to the same points read something differently? This is because different currents flow through the two voltmeters. Now you may say: this is absurd, why different currents flow through the two voltmeters? Can I just simply use only one voltmeter and place it on the right hand side of the circuit, and then flip it to the left hand side? Why would the reading change? The reading does not change as long as you do not cross the changing magnetic field zone. However as you cross the changing magnetic field the voltmeter reading changes gradually from the right hand side value of +0.9 V to the left hand side value of -0.1 V. We can actually compute how this happens and I will do it below. But before doing it, I want to say what is wrong in the "disproof" video above. First, the solenoid is the same size of the circuit and is placed under the circuit. This allows for the gradual voltage change due to crossing of the changing magnetic field to be misinterpreted as a voltage drop on the copper wiring. Second, the explanation is inconsistent with regards to the current intensities. If you compute the intensity in the copper wire due to 1 V difference you do not get 1 milli Ampers, but a huge current because copper wire has almost zero resistance. Also there is a big misunderstanding on the how to compute the flux by stating that a vertical plane has no flux going though it. If the loop would be completely vertical this would have been correct, but the the voltmeter loop also contains a horizontal path closing the circuit and this has non-zero magnetic flux crossing through it. Then I move the connection points A and B and flip the voltmeter wire to cross the magnetic region (see the second picture and notice that the direction of i stays the same: from the voltmeter to r2). I (r1 + r2) = E from which we extract the current in the main loop. Then V read by the voltmeter is V = i R = I r2 = E r2 /(r1+r2) = 0.9 V using the resistors and E value from the lecture. E r2 /(r1+r2) -E = -E r1/(r1 + r2) = -0.1 V with all the intermediate values in between as we flip the device. This effect is shown in Mabilde's video from 17:40 to 18:00, but his explanation is wrong. Alternatively when the voltmeter is flipped all the way to the left we can consider a loop not enclosing the area of changing magnetic field and arrive at the same -0.1 V by using Kirchhoff's just like we did on the right hand side. In conclusion the Walter Lewin is completely correct and the controversy stems from blind trust in Kirchhoff's circuit laws which are valid only when there is no changing of magnetic flux in the circuits and a misunderstanding of Maxwell's equations. gauge transformations of physical fields. The mathematical machinery involved uses fiber bundles and Cartan's language of differential forms. There are two key differential forms: the connection 1-form and the curvature 2-form. Another essential ingredient is that of parallel transport. In terms of physics parallel transport corresponds to the transport of physical information. When we do parallel transport around a closed loop the final state is in general different than the initial state. Here is some trivial example from ordinary high-school geometry. You are walking on Earth along the equator and you carry with you an arrow which points North. You walk 1/4 circumference of the Earth when you decide to walk all the way to North Pole. At any point during your journey you keep the orientation of your arrow at time \(t\) parallel to the orientation of your arrow at time \(t+\Delta t\). Initially the arrow was perpendicular to the direction of travel, and when you started going North the arrow is parallel to the direction of travel. Once at North Pole you deice to take the shortest path to your starting point. What is the orientation of your arrow when you get back? Try this with a pencil and a ball. When discussing gauge theory, the natural language is that of bundles. On bundles, one starts with product bundles but then one proceeds to general bundles obtained by gluing together product bundles. For Standard Model the product bundles are enough, but for gauge theory on curved space-time (string theory, quantum gravity) you need to use the most general bundles. One problem arises then: how to relate what different observers see? Changes in observers are described by cocycles. Cocycles depend on both the topology of the space-time manifold and the structure of the gauge group. The deviation of vector bundles from from product bundles is measured by the so-called characteristic classes (Chern, Euler, Pontryagin, Stiefel-Whitney, Thom classes). To explain the math machinery of all this is a very ambitious project and I am not sure how far along I can carry the series but I will try. The geometry involved is very beautiful (at least to me). Please stay tuned. Before returning to talk about gauge theory I want to discuss a topic out of my personal experience. I started my career in academia, I switched to industry where I was very successful, and I manage to come back to academia. As such I can offer a good perspective of both and hopefully clarify misconceptions. For a little history, I published my first paper second year in college and after graduation I joined the most productive theoretical research group in Romania which was publishing about a paper a month. The sky was the limit and I chose to get my PhD in US. I went to UMCP and after graduation I joined my adviser's recently created company switching to industry where I rapidly climbed the corporate ladder. Now I am back in academia (with a foot still in the industry). In academia there is this perception (and arrogance) that the outside world is not smart enough. This is farthest from the truth. The smartest person I ever met was Alain Connes (and also the most arrogant person I ever met) but beside this outlier, I can state with confidence that the industry has on average the smarter persons. In general their abilities correlate strongly with the amount of money or power they amass. Another misconception is that in industry you do not work on interesting or hard problems. The opposite is true, and I saw time and time again how the state-of-the-art knowledge in the industry is 10 to 20 years ahead of the state-of-the-art knowledge in academia. The best industry knowledge is kept under wraps on a need to know basis as trade secrets and you need to be high enough on the food chain to get to know them. For comparable skill sets, in the industry you earn 2 to 3 times the amount you will make in academia. When I was choosing my PhD adviser, I considered a thesis in particle phenomenology with Professor Rabindra Mohapatra. I had to qualify to be his grad student and after I did that I got to see the fine print of the deal. The entire particle physics group at UMCP (10 professors) had to pull their resources to fund a single research assistant (RA). In comparison, the professors in EE department each had between 10 to 20 RAs due to industry contracts. This turned me off and I picked a better funded adviser. A few years after graduation I was working in the industry and I was in the market for a house. It just happened that professor Mohapatra was selling his house and I got to visit it as a buyer. I did not bought it in the end but already within a few years in industry I had the same buying power as a distinguished full professor in academia. When you climb the corporate ladder in the industry there are standard steps. You start as an intern and the requirement there is to have potential to grow and to be liked by the group. Then you are a junior engineer who is working under close supervision. When you can work independently in one area you become a senior engineer and a typical salary is around $90K/year. If you can work across the board in any area, you are a principal engineer. From principle the next step is supervisor where you are responsible for the results of an entire team. Next step is manager who is a supervisor with power to do performance evaluations and make salary decisions. Up to this point the focus is on work and as a manager you get to know the dirty secrets but you still do not have a seat at the big boys table. Next is a director who is an execution machine. The most important skill of a director is to defend his back as peers and people above are out to get him. A director with industry knowledge is a vice president. A VP can run the company but he is not yet vetted from the social part: he is not a member of the C-level club (CEO, COO, CFO). At C-level you are a god for the company and your statements carry legal responsibility. For the people entering the industry, one general word of advice is that the human resource department is never your friend - don't get fooled by their friendliness or lunch events they organize. They are there to prevent the company from being sued and they do the dirty work of firing people - which no manager enjoys. I managed to climb all the way to director and VP level, and at every large company I worked the C-level are all crooks-no exceptions. Very smart, very competent, very polished, experts in the art of dissimulation and manipulation, and rotten to the core. Power does corrupt. I came to know countless unbelievable horror stories. Now back to physics and academia. One thing I hate was the publish or perish state of fact. Not everyday you have a big breakthrough and 99% of the published papers are utterly useless. People organize in groups citing each other meaningless results, and if your paper is correct most of the referee's comments are about not citing something. When I exited academia I made the decision to come back when I would have something important to say. Coming back turned out to be much much harder than I thought. Everything was an uphill battle: first results, gain archive endorsement, first paper, first conference, first teaching assignments. When you are in the system you cannot see how much your adviser is supporting you in your academic career. If you worked in industry and want to come back to academia only because you like physics you will not be successful. The first thing you need is to have a research domain of your own and also to have meaningful results. What matters the most is what problems you are working on and for this you need good guidance. Good guidance is hard to come by even when you are in academia. I was lucky to have met a remarkable person: Emile Grgin who worked on a research topic from Bohr. Bohr passed this topic to his personal assistant Aage Peterson who worked with Grgin as postdocs at Yeshiva University in the 70s. Grgin switched to industry and I met him as he was retiring interested to make more progress on this topic. I learned the topic and I carried the torch. Lucky for me, to no merit of mine, the area turned out to be a gold mine. So now I was having something meaningful to work on and something meaningful to say and it was time to start the transition back to academia. Also there was no competition in my research area - a wonderful thing. I might have been a young tiger before in academia but now I was a big nobody as far as academia was concerned. The first hurdle was rising above the large background noise of crackpots. I identified this organization FQXi and I won a third prize there on one of their essay contests. This opened up connections for me and now people would no longer ignore my emails and gave me the cold shoulder. I started blogging for FQXi and this is when I hit the second roadblock. After crackpots there is a layer of charlatans. I ran into the biggest of all Joy Christian. The problem was that he had powerful friends with a lot of clout and fighting Joy blacklisted me and delayed my academia comeback plan by 2-3 years until Joy's credibility was all gone. Finally after wasting in the desert of blacklisting I gained archive endorsement, I started to get invited to conferences, and I started publishing again. I also became a referee on various journals. It was time to start a blog (this one). The blog provided a much needed discipline to work a given set of hours a day on physics. In industry you live under a constant shadow of a deadline and it is very hard to set hours aside in the day to do anything else productive. Now it was time to complete the switch and make money again from a physics job. Here I ran into another large problem. Physics pays peanuts and now I cannot go back and live like a poor grad student anymore: I have a large mortgage to pay as well as college expenses for my kids to the tune of hundreds of thousands of dollars. I needed a side job in the industry to make up the difference, but no job provides that flexibility. The answer was to start my own consultancy company. This is no easy task, but I did have all the knowledge I needed. So I finally had the first paying job at a university jumping between my company work and my physics duties. Physics was no longer a hobby. Today I am very busy working over 80 hours a week and I am climbing very rapidly the academic levels. Coming back to academia is a game of building your credibility. A funny observation is that at every level no matter how low there are a lot of politics being played. To me this is very amusing. I know how to read people and get them what they expect from me when they expect it. One more observation. Industry is capitalism with the good and the bad. Academia is still run by the rules of a feudal system. There are big established hierarchies which are defended at length without regard for truth. Sadly most people in academia do not seek truth but power. You can see the hierarchy at the conferences on the order and length of time given to the speakers. I found this obscene. In a small world where everybody knows everybody the arrogance of most of the hot shots runs through the roof. There are also scientific crooks who abuse their power for personal gains. There are notable exceptions however. One of the most down to earth nice person who listens to what the lowliest grad student has to say is 't Hooft. I don't agree with his approach to quantum mechanics but I value him as a decent person. Another decent person I admire is Avshalom Elizur. For the record I am not associated with either of them or their groups and I am not praising them for any future gains. I am genuinely impressed by the way they conduct themselves in a sea of feudal system arrogance.